Beer before noon is usually against the rules, but it’s worth making an exception for these crepes, which incorporate two different beers brewed in Central Texas. I made these for brunch yesterday with my sister and her husband. He’s a microbrew afficianado and she’s pregnant & craving beer, so I know they would love this recipe. Mom, don’t worry– the alcohol is all cooked out in the finished product; your future grandbaby is safe and well-fed! 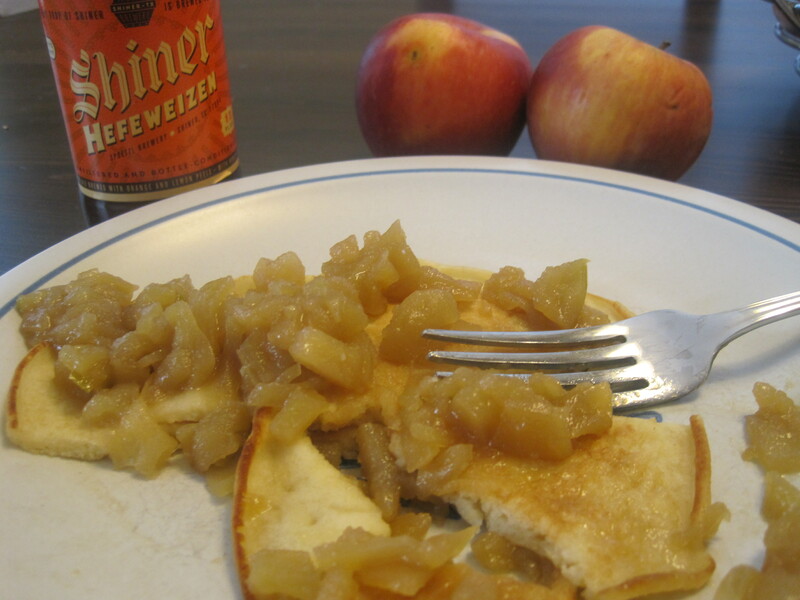 For the crepes, I followed the recipe for beer pancakes from Allrecipes.com, using Shiner Hefeweizen in the batter. The citrus and wheat in the Hefeweizen give the crepes a light texture and sweet, slightly pungent flavor. Traditional maple syrup would be much too sweet so instead I topped them with a homemade compote of locally grown apples and Independence Brewing Co.’s Bootlegger Brown Ale. First, mix crepe batter, either by combining all ingredients in a blender or whisking by hand. Let batter rest while you prepare compote. For compote, peel, core and dice three apples. Melt butter in a saucepan and add apples. Sautee until tender, then add beer and sugar to the pan. Stir to combine. Cover and let simmer for 10 minutes. Heat crepe pan and lightly grease with butter. Measure 1/4 cup batter into pan and tilt pan to spread batter evenly. Once crepe surface is covered in pinhead-sized bubbles, it’s ready to turn. Gently loosen crepe with a spatula and flip it over. Cook for about a minute more, then tranfer to a plate. 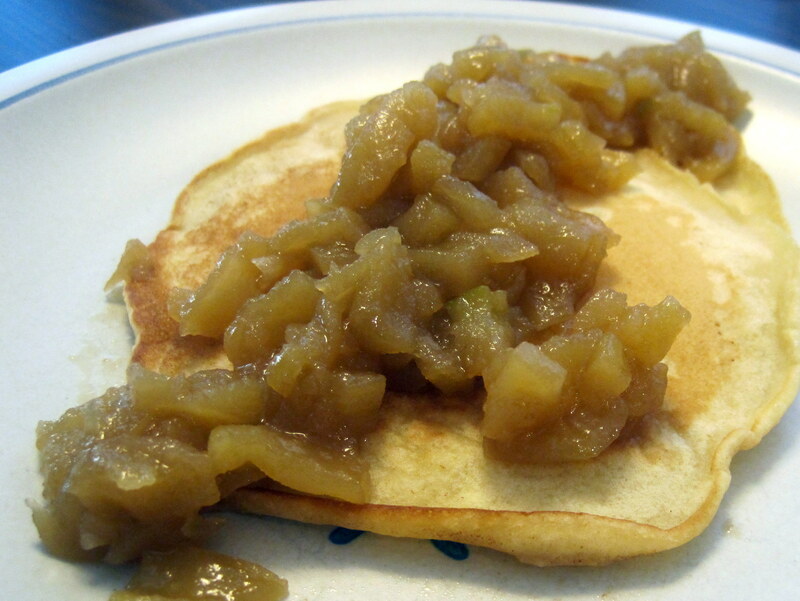 Top with apple compote and serve immediately. 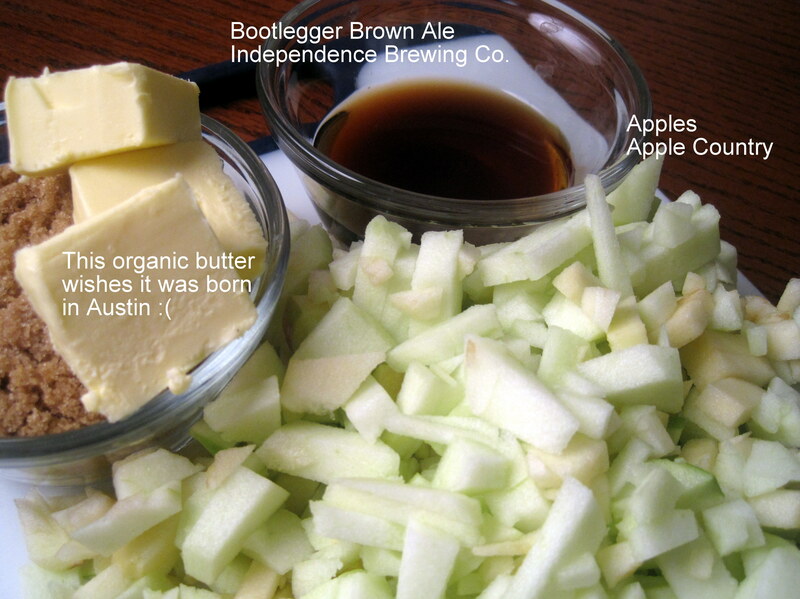 This entry was posted in Breakfast, Desserts, Vegetarian and tagged Apple, Beer, Butter. Bookmark the permalink. Yummmm! This looks amazing and creative.